Follow us on Facebook for more pictures and customer testimonials. "I have been shooting your Supreme tube for almost 4 years now, and it's still the best decision I ever made! 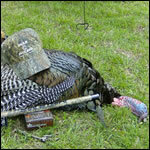 Seeing birds crumple when you pull the trigger is what it's all about. I started the new year off with an afternoon pheasant hunt and figured I'd share the outcome, and say thanks again for a great product. Penny and Jake are fans of Wad Wizard, too!" 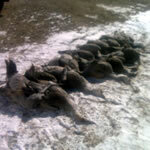 This picture was taken on the last day of sandhill crane season last winter. It was 9 degrees with a 20 mph north wind-cold. We got these to come into the far side of the decoys at about 55 to 60 yards. We smashed them with 1 3/4 ounce of #2 Hevi-shot reloaded to 1300 fps through the chronograph in our 10 gauges equiped with the Stud10's. It was like they ran into a brick wall. Very impressed with the patterning and knockdown with your product, as these birds are very difficult to knock down, much less kill dead. 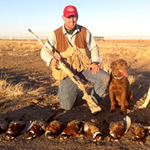 “Just wanted to let you know that I have been a duck hunting guide in South Louisiana for the past fifteen years. 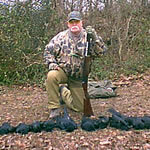 In a normal season I will kill around 800 birds. I have never in my life seen anything more effective than your Wad Wizard Choke. 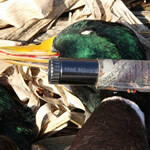 These days it seems there are a lot of products in the duck hunting industry that are just plain gimmicks. Not this. Range and knock down power are unbelievable. I shoot a Wizard in my 12 gauge that I duck hunt with everyday. I would recommend this product to anyone that is a serious waterfowler. “I am a returning Wad Wizard customer, having previously purchased a SWAT12 for my Benelli Nova. At 3pm this past Friday, I ordered a SWAT12 for my Benelli M2. On Saturday, at 11:35am, my SWAT12 for Crio barrel arrived! This evening I shot bobwhite quail over my adult pointing Lab and Pheasant over my pointing Lab pup, without having to change tubes or shells. What's more, all the birds were dead before they hit the ground. I know I said this with my first SWAT, but THANKS for making a fantastic product and having customer service that's just as fantastic! "I just wanted to let you know how pleased I am with the Wad Wizard Supreme Choke Tube. I dropped this 26lb Tom about an hour into opening day from about 55 yards through some foliage. There was no doubt about the shot. I cannot wait for Duck Hunting on the Mississippi this fall. The fly over duck is now in trouble!" "Just wanted to say thanks for coming up with such a great product. I went out with my boss and about 12 of his friends who were shooting very expensive shotguns. When a bird would get up, it be out there about 60 yards and everybody would take a shot but no could bring him down. When I shot he would ball up and hit the ground with a thud. It was some good times. They were wondering what I was using for shells. They could not believe I was shooting steel shot.I had to explain to them that it was the Wad Wizard." I used to use factory choke tubes and it seemed as though I was constantly switching between them. I was either putting in a super full for turkeys, a modified for close in waterfowl or sometimes a full depending on the situation. Two years ago for Christmas I received a Wad Wizard Supreme and things changed! I haven’t taken my Supreme out of my 870 since it went in. Talk about a mean tube that’s versatile! I use it on Turkeys in the spring and ducks and geese in the fall. Using a Wad Wizard is like hitting a fly with a fly swatter. Now when I pull the trigger I mean it!!! "I went out for a few minutes this morning and "Swatted" a few ole Black Bandits. I routinely take birds out to 35 and 40 yards with the SWAT tube and # 7-1/2 shot, my load of choice...lots of shots are straight over the top...this tube is a real killer with the short shot string...nasty crows never know what hit 'em."